For an academic turned novelist, the habit of acknowledging my sources is one that I find hard to discard. So ingrained is the habit that my last novel included endnotes. That story was rooted in historical events, while my work in progress is set in alternate worlds. There’s no history to guide the story, no need to get the dates and facts right. Or is there? With my manuscript half finished, I recently found myself reflecting on how the work has been shaped by an unlikely miscellany of writers over the last eighteen months. The book is a dystopian novel set in Australia and England more than a hundred years into the future. There are two dystopias: A post-apocalyptic Australia, and a post-Enlightenment England, by which I mean a society in which most people have given up thinking for themselves. A major challenge of writing dystopias is that they must be plausible: My invented futures must contain the pathways by which they have come from their pasts. In the early stages of imagining the novel, I consulted Futurevision, Scenarios for the World in 2040 by Richard Watson and Oliver Freeman to get an idea how professional futurists think, which pretty well confirmed my plausibility theory. Some time later, I read Rhonda Roberts’ Gladiatrix (Kannon Dupree: Time Stalker), a terrific lesson in the importance of making alternate worlds coherent. Rhonda gave me some feedback on an early draft that got me repairing holes in the back story. Around the same time, I spotted Niall Ferguson’s The Great Degeneration: How Institutions Decay and Economies Die at my local library, thinking that it would give me some clues about how my dystopias got where they are. It was broadly useful, but its main impact was its persuasiveness: Ferguson is way to the right of me in his political views, but by the end I was eating out of his hand. I wriggled out of his clutches in the last chapter (no spoilers). The last word goes to Margaret Atwood’s In Other Worlds: SF and the Human Imagination. It’s a lumpy compilation of a book in my view, but it answered a question that had been plaguing me: Why do my dystopias echo The Handmaid’s Tale, Nineteen Eighty-Four, Brave New World, and other works in the canon? The answer: This is a genre with its conventions and tropes. Get over it. (At least that what I got from Atwood; I’m not sure she actually said that.) I had a quick detour through H.G. Wells’ The Island of Doctor Moreau to wrap things up. My book has multiple voices, one of which comes up in fragments of a popular history written decades into our future. I originally drafted these as (fake) academic history, but my friends in our writers’ group in Sydney got a bad case of lexical indigestion. One or two of them suggested I try using a popular history approach – that odd variety of writing that turns dry history into page turners. While not exactly history, Naomi Klein’s The Shock Doctrine: The Rise of Disaster Capitalism gave me a useful stylistic model. Paul Ham’s The Target Committee showed me how much historical content you can load up into a paragraph without it turning to sludge. In the end, I found my own style of fake popular history, which turned out to have a satirical thread in the weave. Bonus. Reading Stephen Pinker’s Enlightenment Now: The Case for Reason, Science, Humanism, and Progress, it struck me that dystopias can be defined in terms of their relation to the rational thought that is the hallmark of the Enlightenment. If I imagine a bell-curve where the top of the curve represents the pinnacle of Enlightenment thinking*, then the two tails are post-apocalyptic Australia (where people are slipping back into the Middle Ages) and post-Enlightenment England (where other people do your rational thinking for you). But the main lesson of Pinker’s book is its stunning optimism: It’s packed with graphs to convince the reader that we’ve never had it so good. Sometimes I wondered why the world needs dystopian novels when we’re already in Utopia. Now for some specialist influences. I’m a linguist by profession, so it’s not surprising that I have a lot of fun with language in my books. My dystopian Australia has creole languages, and I turned to Derek Bickerton’s Roots of Languageto check the authenticity of the speech I was putting into my characters’ mouths. I rank Bickerton’s book among the top five scholarly works I have encountered in my entire career. Vale Derek Bickerton, who passed away in March 2018. Another Professor, Ted Bryant, was my source for technical detail on tsunami. 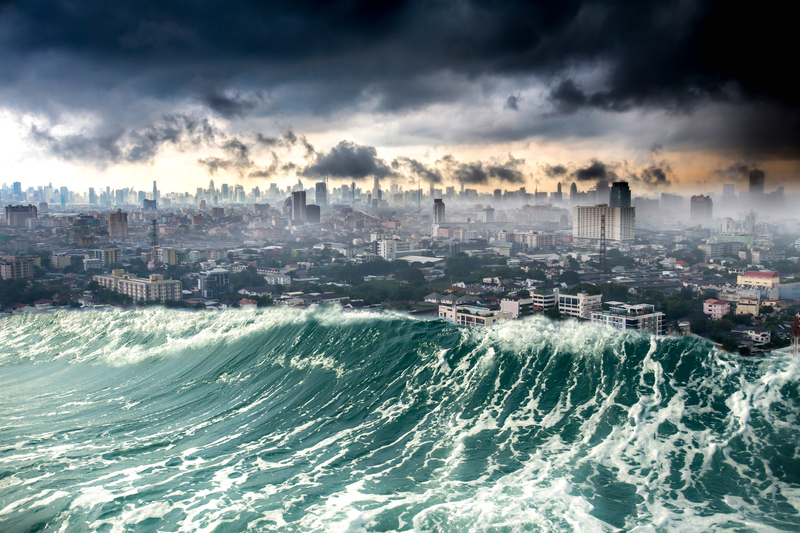 Bryant’s Past tsunami in Australia gave me the idea of a tsunami triggered by a piece of the continental shelf slipping off the east coast of Australia. The New South Wales State Emergency Service tsunami web pages filled in more detail. And let’s throw in some religion: My two dystopias handle faith in quite different ways, and I had to read up on vernacular religion to get a sense of how an isolated post-apocalyptic society would handle these things: Marion Bowman’s journal article Vernacular Religion, Contemporary Spirituality and Emergent Identitiesgave me some directions, but I shied away from going in too deep into what looked like a controversial field. On the question of freedom of speech, I carefully read The United States Constitution; my specific question was the extent to which the First Amendment could be used to constrain artificial intelligence. And many hours were consumed in following – and not properly documenting – leads on such subjects as accounting, climate change, pre-industrial economics, and post-polio syndrome. I should also not forget three books that are in a sense characters in the novel: A Midsummer Night’s Dream, the King James version of the New Testament, and Thomas Hardy’s Jude the Obscure. Perhaps the sweetest hours of my background reading were spent during a balmy trip to Far North Queensland, where I visited Cairns and Kuranda, two of the locations of the novel. My unlikely reading material was The War Outside My Window: The Civil War Diary of LeRoy Wiley Gresham, 1860-1865, edited by Janet Croon. LeRoy was a teenager, the son of a wealthy plantation owner, who spent the war years crippled and suffering from spinal tuberculosis in Macon, Georgia. The diary is an account of daily life as the Confederate cause slowly collapses, and LeRoy’s health deteriorates. As I read, I realised that living conditions in 1860’s Georgia were not unlike those I was trying to depict in Kuranda in 2126: Constant sickness, extreme summer heat, intermittent supplies of basic commodities, plagues of insects. This, by the way, was by far the best book I read in 2018. And of course, walking alongside Atwood, Bickerton, Shakespeare and all the others are the members of the Write On! writers group at the New South Wales Writers’ Centre here in Sydney – Sarah, Garry, Karen, Michele, Nore, Julia, Rhonda. Stick with me till the last page, my friends! *I place this at about 1975, but I’m happy to argue the point. So interesting when you pull it all together like this. A pathway of reading needs. Books can lead you to all sorts of directions.